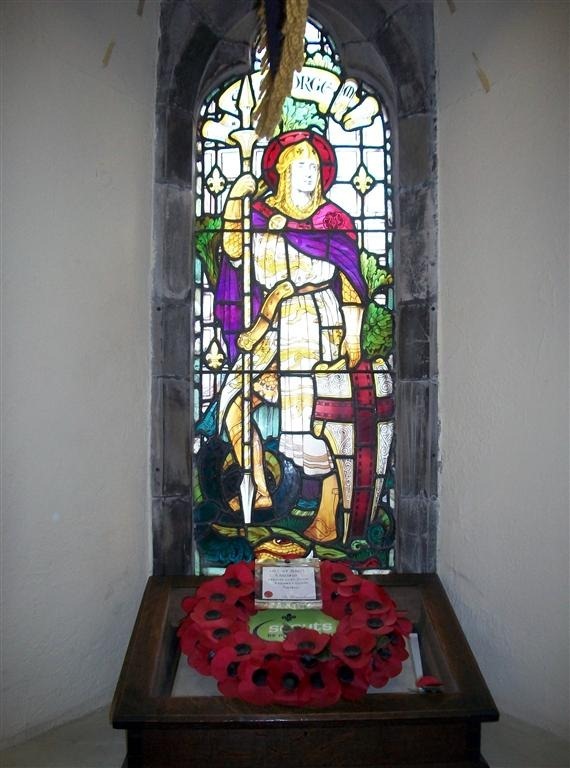 The Scout’s Memorial window in St. Andrew’s Church shows St. George, the Patron Saint of Scouting and has three Fleur-de-lis in the background. The Memorial is made of mahogany and was made by the then Assistant Scoutmaster George Emmerson Smith MM. The Memorial is to the right of the Window. With regard to the memorial windows, the Vicar stated they were well in hand and proposed the unveiling of the Neveitt window be on Low Sunday in the afternoon and the Scout window on St. George’s Day at night. This was seconded by Mr. J Stevenson and carried unanimously. The Vicar proposed Mr. Ronald Copeland be asked to unveil the Scout Window and also asked Mr. E Gleaves who was the first Scout Master. The Neveitt window the Vicar proposed Miss Hall who was also providing the musical service. Both met with full approval of the meeting. The Vicar stated the plates were in hand. The mahogany tablet for the Scout window, Mr. T Taylor had kindly given the wood, Mr. George Smith was preparing it and Mr. Lawton had promised to do the lettering. 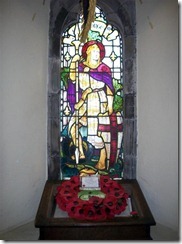 The Window and Scout Memorial were dedicated on 28th April 1924. 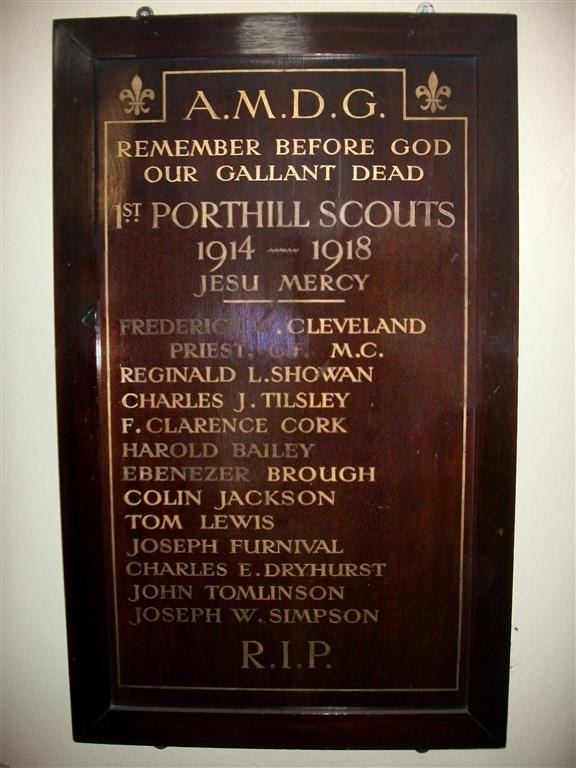 Following the ceremonies on Sunday at Porthill Church, a third window was unveiled on Monday evening to the memory of the twelve Scouts of the Porthill Troop who sacrificed their lives in the War. There was a large congregation, including several Troops of Boy Scouts. The window, containing the figure of St. George, was unveiled by Mr. Ernest Gleaves, the first Scoutmaster of the 1st, Porthill Troop, and dedicated by the Vicar (the Rev. J. A. Nash). At the organ was Assistant Scoutmaster G. Smith, who has been with the Troop since its formation. The Vicar was accompanied by his curate (the Rev. H. H. Fox), and the Rev. R. W. Wardle (curate of Wolstanton). After responses a procession walked from the chancel down to the window. Heading the procession was the bearer of the crucifix, followed by the thurifer and the candle bearers, the curates and the Vicar. A number of Scouts also approached from the centre aisle and stood near, led by one carrying a flag. During the procession the hymn, “Let saints on earth” was sung. After the unveiling and dedication ceremony the Last Post was sounded by Patrol Leaders W. Simpson, D. Cartridge and E. Farr, jun. The hymn, “On the Resurrection Morning” was afterwards sung. In a brief address the Vicar said the leaders of the Scout Movement were proud that, though so young, it was old enough to have sent forth those who had rendered such heroic service in the War. He wished to emphasise the fact that the lads commemorated by the window, almost without exception, went into the Army before they need have done – in some cases enlisting before their proper age. The oldest of the lads at death was only 22. The Scouts who remained must make good the loss of those lads. They would if they had the same vision and the same sense of duty and loyalty that St. George had, and took their Scouting seriously. At the Vicar’s request the Scouts rose and repeated the Scouts’ Promise after him at the salute. The hymn, “Onward, Christian Soldiers” and Benediction brought the service to a close. The various troops afterwards marched to the Church Hall, where refreshments were served. Here, also, Mr. Thornton and Mr. Jones were presented by the Vicar with the Wood badge. 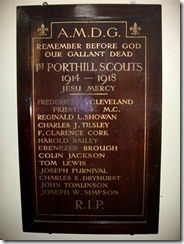 The Troops attending the service were as follows: – 1st Burslem (St. Andrew’s, Porthill under A.S.M. E. Farr, W. Bird and G. Smith, M.M. ); 2nd Burslem (Smallthorne, under D.S.M. W. Thornton, A.S.M. W. Jones and A.S.M. J. Cartwright); 3rd Burslem (St. Paul’s Burslem under P.L. G. Brindley); 4th Burslem (Bethel Burslem under A.S.M. G. Stockley and A.S.M. T. Goodwin); 6th Burslem (Hill Top, Burslem, under S.M. E. Jones); 8th Burslem (Congregational Church, Burslem under S.M. G. Adams, A.S.M. J. Cartwright and A.S.M. J. H. Robinson); 1st St. Margaret’s (Wolstanton, under S.M. A. E. Aldersea); and 1st Basford (Basford Church, under P. L. Kemp). On the ledge in front of the window, is kept the Church’s Book of Remembrance, which not only commemorates the Scouts, but all the men of the Parish killed in WW1 and WW2. Mention was made of the Book of Remembrance that was made by Rev. A A Cox (curate) in his own time. It was suggested that it be put in a wooden display case which would cost £6/-. You can download a copy of the Book of Remembrance here – this is the full book.